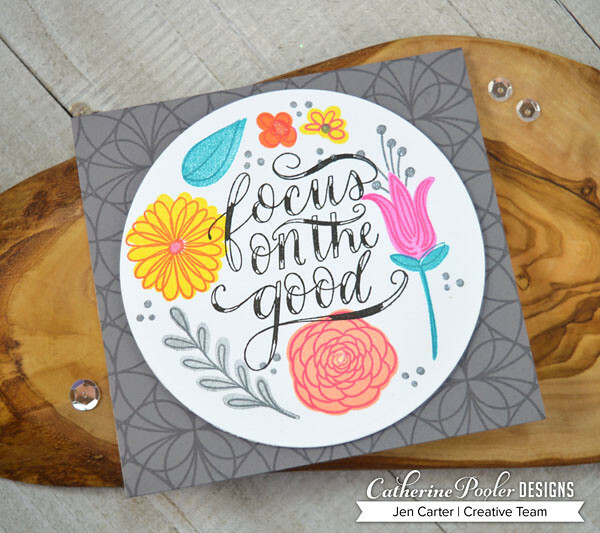 Jen's Ink Spot: Wild & Wonderful by Catherine Pooler Release Day! 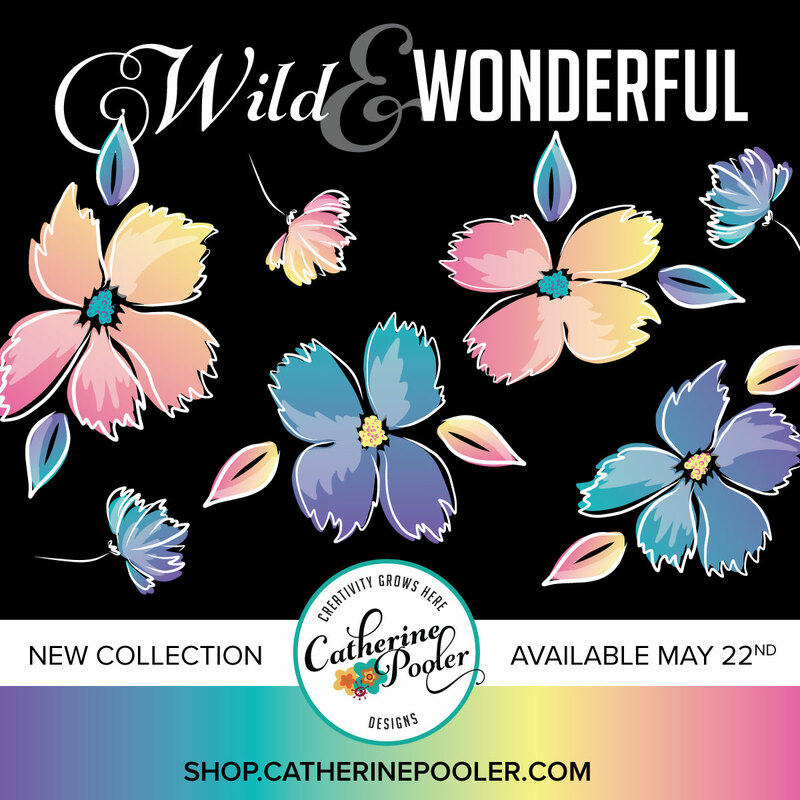 Welcome to release day for Catherine Pooler's Wild & Wonderful product line! Products are NOW AVAILABLE for purchase in the Catherine Pooler store including THREE new ink colors! Yippee!! You all know how much I love Catherine's inks! Today Grape Crush & Limoncello inks are releasing and the much anticipated Be Mine ink that was included in a previous Stamp of Approval box is also releasing! Yippee!! These three inks are part of a new collection of inks in the Party Line called Carnivale that also includes All that Jazz which ranks as one of my all time favorite CP inks! Check out the Carnival Bundle here. Today's cards are popping with color! I love bold floral images with black & white stripes! The Wonderful Wildflowers stamps definitely pop against the stripes in this first card. Aren't the flowers in the Wonderful Wildflowers stamp set gorgeous (there are coordinating dies also)? I love how many color combinations you can make with these. I am sharing another card tomorrow that uses the same flowers but they are subtle and elegant. My color combinations for the flowers & leaves are (ink colors linked below): Flirty Fuchsia & Grape Crush, Limoncello & Orange Twist, Bellini & Party Dress, All that Jazz & Something Borrowed, Lime Rickey & Grass Skirt. The centers of the flowers are also stamped with Party Dress & Limoncello. The sentiment is from a new stamp set called Note of Thanks. The black & white striped paper is from the Black Tie Gala Patterned Paper Pad which is one of my favorite paper pads! This next set of cards are very similar. The only real difference is that on one I used the coordinating die cuts and popped up the images and on the other one the images are stamped directly on the cardstock. I die cut my card base to 4 1/4 x 8". I stamped the fun new Kaleidoscope Background on to the Smoke & Mirrors gray carstock with VersaMark ink. 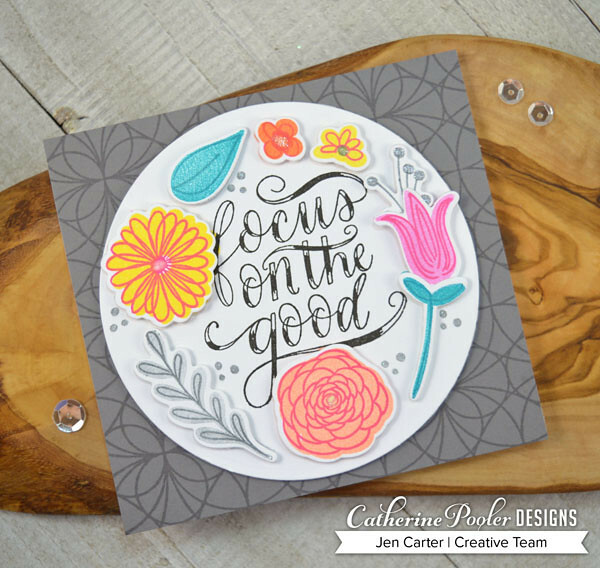 I die cut a circle with a die from my stash and then started stamping the flower & leaf images using the new Focus on the Good Floral stamp set. I stamped the images with lots of CP inks (individually linked below): Be Mine, All that Jazz, Limoncello, Party Dress, Bellini, Orange Twist, Black Jack, Daydream. 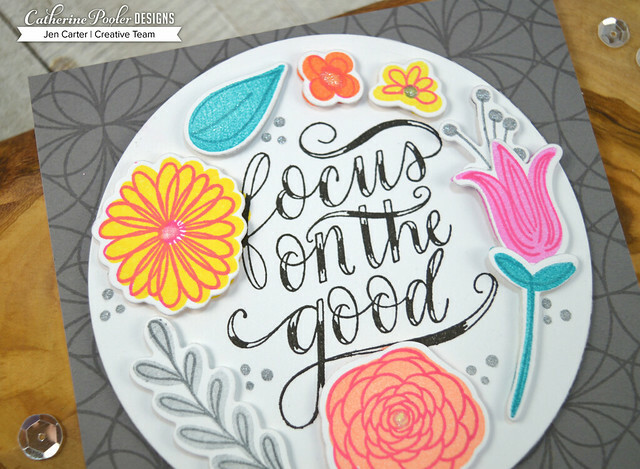 The sentiment is also in the Focus on the Good Floral stamp set. On the 2nd card I used the coordinating Focus on the Good dies and popped them up with dimensional tape. I also used a Nuvo Aqua Shimmer pen to add glitter to the centers of the flowers, stems and to the leaves. Everything I've shared today is available to order now here...and that includes the three new ink colors! You'll even find the "I Want it all Bundle!" Leave a comment on my blog for your chance to win! We’ll randomly choose a winner from FIVE different blogs to win two free ink pads from our shop along with FREE shipping on your order! Winners announced on Friday, May 25th on Catherine's blog. Love these bold florals and your color choices. The new background stamp looks awesome in versamark on gray cardstock too! I love the smoke and mirrors cardstock and see some case cards happening as soon as I can get my hands on the package! Great cards! Fantastic cards! Love the bold elements you included and balanced perfectly in your designs. Wow, I LOVE your first card, the colors just pop and are so vibrant and beautiful! Love the bright bold colors!! Makes me happy!! I think I like the one layer version of the gray pair best. And the black stripes behind the flowers looks great. Your first card really got my attention. Those colors with the B&W pattern paper are amazing. Thanks for the awesome inspiration. WOW! Look at those colors! The flowers make me think of a tropical paradise. Great cards! I love the flowers, your color choices are perfect! Beautiful cards, Jen! I love how those colorful flowers POP against that black & white striped paper. Wow, love the first card. It says summer to me which is my favorite time of the year. Love the comparison of dies and no dies. Your floral arrangement on the circles is gorgeous. The flowers show off the gorgeous inks SO well. I love the look of fuschia and grape crush layered! OMG. So creative. Love a black & white background. Makes the flowers pop. Circle card beautifully done! Love the flowers on the black and white stripes. They really pop! Love the background stamp done in Versamark on the gray cardstock. Thanks for sharing. Love the stripes and the pretty flowers! I love the card with the black and white stripes. It makes the flowers really pop!! Wildflowers or butterflies? Your lovely card makes it even harder to decide. Really beautiful cards. Love them. Great cards!! Makes me want more! 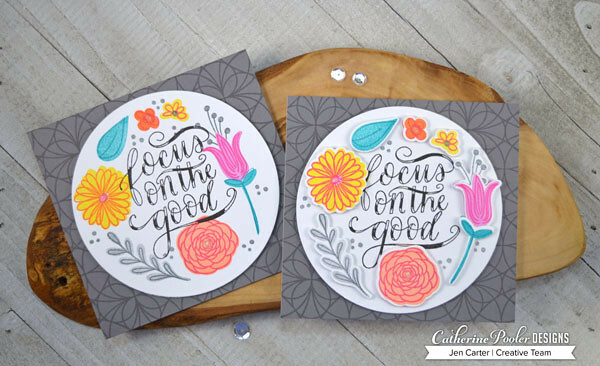 I'm not a flowery girl, but I sure am loving this new set of layering stamps! I must get me some more girly friends to send cards to! That black and white striped background really makes those flowers pop. Beautiful. Wow! Loving this new layering stamp set. These inks are so awesome and beautiful bright colors and can't wait to order some. Thank you so much for sharing your card so pretty. I just love that bold background! I love all your cards but the one with the black and white stripes is incredible with the bright colored flowers. I love them both. My favorite is the grey background I think. Although those colors with the bold black stripes... hmmm. Thanks for the inspiration. I love, love, love the colors of the flowers on the first card. Unexpected!! Thanks for sharing. Beautiful cards! Your flowers are amazing on both of them! I especially like the top one where you have a black and white striping background! It just makes the flowers pop!! Wow - so pretty and bright. I love the card with the bold flowers against the black and white! The black stripe with those vibrant colored flowers makes a statement. cute set of cards and I like the black and white background for the bold flowers. Your cards are wonderful! Love the Thanks card with the Black Tie Gala paper--the pops of color are beautiful! Thanks for sharing! Amazing cards! I love that classic look of the black and white with the bold flower colors...gorgeous! Happy, happy cards! Love the bright colors! Love the boldness of these cards! Happy cards for sure! Love those gorgeous florals! The colors are phenomenal! And that black & white paper is a must have! Oh my goodness, love your cards,so pretty! Thanks for the chance to win and sharing. Love your bold wildflowers, just brightens my spirits! Your first card is my favorite of all the CT for this release. I love it so much!! Love the new colors.. Really great background stamps! Beautiful card designs! Ooohhhh! Both cards are stunning! The black and white striped card is so stunning! So bright and colorful! Love it! So pretty - love the Thank you card with the bold black and white stripes and the gorgeous flowers. Fabulous cards! I love how Catherine's floral sets are always kinda funky! So much fun! I love the 2 set of cards and actually think I like them stamped directly on the circle rather than popped (weird cause I always love to pop). 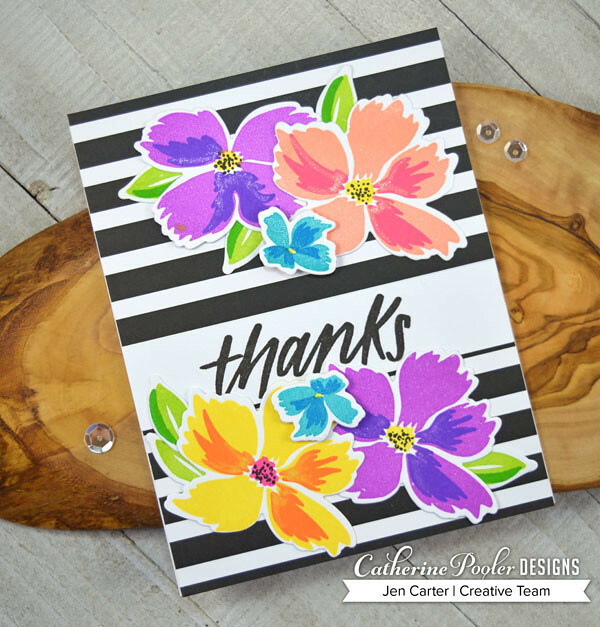 The beautiful gray card base is the perfect background for those colorful flowers! Thanks for sharing your creativity and talent with us! Love the black and white as a back drop for all that color! Love the flowers .. Wow !the colors are awesome! I love bright and cheerful cards, and yours sure fit the bill! Great cards! Nice cards :) Great use of neutrals and eye popping color!!! Thanks for sharing! Love all those gorgeous flowers! Beautiful cards! Fantastic cards! I love the flowers on the striped background. So striking! That colorful floral card is just wonderful ! love, LOVE, love that first one Jen - so crisp and clean and pretty! And that second one - so soft and pretty! Great cards! Love them all. You've got a style all your own. So pretty! Love these ideas. Thanks for sharing on this fun blog hop!! Wow, I love your first card. It is just striking. The smoothness of the colors in your flowers makes me wish I could touch it. Velvety!